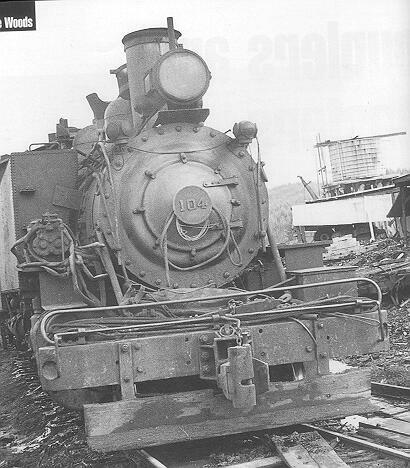 More often than not, logging railroads were composed of a hodgepodge of equipment picked up second, third, and even fourth-hand from whatever was available, with some equipment even knocked together in the company's own shops. As one might expect, this range of rolling stock and motive power from different sources often caused trouble when trying to couple all of it together. Some cars might have link and pin couplers, while others were equipped with knuckle couplers, and even those cars so equipped often had them mounted at different heights above the rails. However, the men who ran these lumber operations were nothing if not ingenious, and were used to solving problems far out into the woods with whatever was at hand. To solve the problem of mismatched knuckle coupler heights, one or both knuckles were vertically extended by longer steel plates welded to the original knuckle. Link and pin couplers were allowed to mate with knuckle couplers by slotting the knuckle and drilling it for a pin. Sometimes the actual knuckle was removed altogether if it wasn't required to mate with other equipment. Oregon-American No. 104 has a front coupler with an extended knuckle. It's also been slotted and drilled to allow coupling with link and pins, roosters, or the eye of a strap. 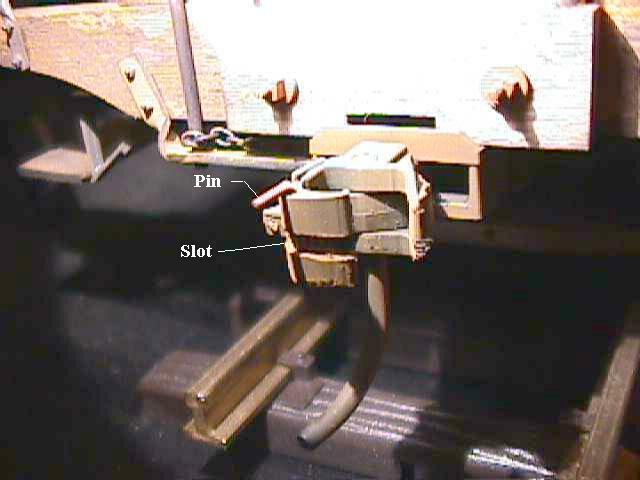 Left - A link and pin coupled to a slotted knuckle coupler. Here, the actual knuckle has been removed. Middle - Extended knuckles allow coupling these cars with different coupler heights. Right - The cars here have drastically different coupler heights. Again, extended knuckles allow them to mate. I've successfully used the same practice of slotted and drilled knuckles on my own 1:20.3 rolling stock. The above photo shows one end of my Hartford Caboose. This car is equipped with Kadee couplers. To allow it to mate with link and pin log cars, I've slotted the knuckle with a Dremel tool. The knuckle is drilled to accept a pin made from 0.030 brass wire with a 90 degree handle bent into it. The thin cross-section of the Kadee knuckle required drilling further back on the knuckle than the prototype, as well as the use of a much thinner pin, but it works great and, like the prototype, allows me to mix equipment as desired.